Sidney's Jenna Smith runs for first as Troy's Lilly James picks up her bunt during a Greater Western Ohio Conference American North Division game on Tuesday in Troy. Sidney’s Naida Stephens slides safely into third just ahead of the tag by Troy’s Lilly James during a Greater Western Ohio Conference American North Division game on Tuesday in Troy. Sidney’s Hallie Westerbeck hits during a Greater Western Ohio Conference American North Division game on Tuesday in Troy. Sidney's Lauren Barker catches a hit next to Troy's Tia Bass at second base during a Greater Western Ohio Conference American North Division game on Tuesday in Troy. Sidney's Lauren Barker pitches during a Greater Western Ohio Conference American North Division game on Tuesday in Troy. Sidney’s Hallie Westerbeck throws to first ahead of Troy’s Megan Malott during a Greater Western Ohio Conference American North Division game on Tuesday in Troy. TROY — First-year Sidney coach Kerri Adkins has jokingly asked her players to buy her stress balls with all the tight situations the team has had through the first few weeks of the season. 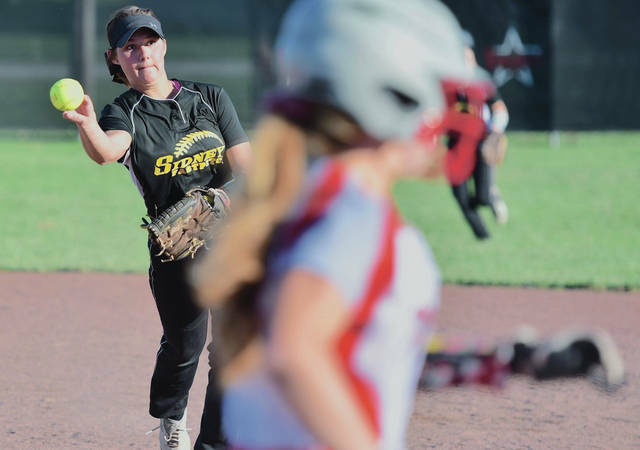 If she’d have had them during the seventh inning of a Greater Western Ohio Conference American North Division game at Troy on Tuesday, her hands might have got sore. Luckily for the Yellow Jackets, Tuesday’s tense situation came as the team made a big rally. 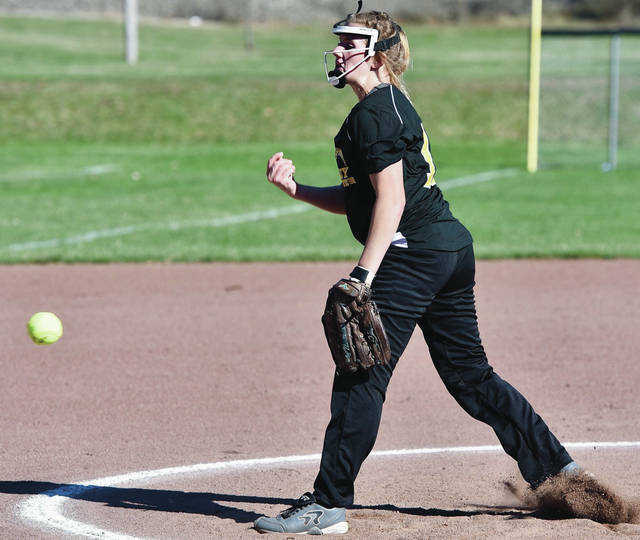 Sidney scored six runs on five hits and one walk in the seventh and staved off a Troy comeback attempt in the bottom half to earn a 13-10 victory. It’s the first win over a North Division opponent this season for Sidney (3-6, 2-3). The Yellow Jackets beat Xenia in a crossover game last Friday for its first American League win of the season. Sidney scored four runs in the fourth to take a 6-2 lead, but the Trojans (3-10, 2-3) scored three in the bottom half of the inning and then scored two in the fifth to take an 8-6 lead. The Yellow Jackets scored one run in the sixth, which Adkins said helped spark the big rally in the seventh. Sidney senior infielder Allie Herrick reached first base on an infield error by Troy to start the seventh. Heidi Aselage hit a single to center field then Alli Milanese hit into a fielder’s choice that saw Aselage thrown out at second. Jenna Smith beat out a bunt single to first base to load the bases for MacKenzie Benshoff, who hit a single to right field to score one run and tie it 8-8. Naida Stephens then hit a grounder to Troy shortstop Ella Furlong, who fired a throw to home plate that went by catcher Paige Nadolny and allowed two runs to score to give Sidney a 10-8 lead. 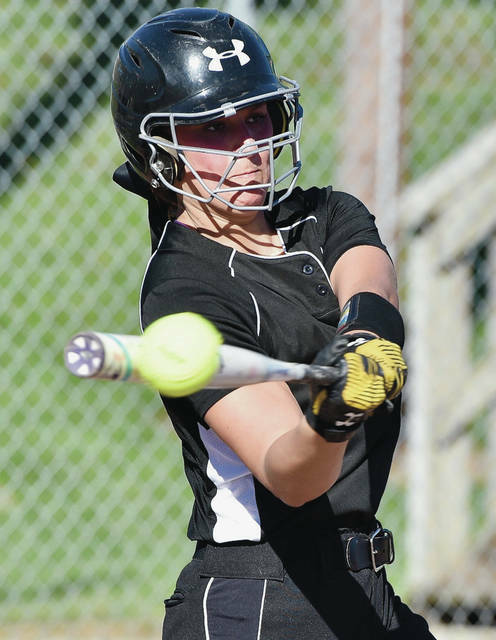 Madison Osborne walked, then Hallie Westerbeck batted in a run on an infield groundout. Lauren Barker followed with a bloop single to center field that fell in the middle of three Troy fielders to score two more runs. The Trojans got out of the inning without any more problems and tried to rally late. Lilly James led off the bottom half with a shot to center field that hit off Stephens’s glove. Megan Malott then reached first base after a fielding error by Barker, who started at pitcher and moved to shortstop in the sixth. Josie Rohlfs then hit a line drive to Barker, who couldn’t field it. After the ball fell to the ground, though, Barker scooped it up and threw out James at third base. Paige Nadolny flied to right field for the second out. Briana Lavender hit a triple to left field that scored two runs and brought Troy within three runs. Tia Bass, who had hit in each of her first three plate appearances, grounded out to Barker to end the game. The Yellow Jackets lost a big lead on Monday and fell 10-5 to Troy. Among other tight early-season games was the team’s first win of the season, a 6-5 defeat at Beavercreek in extra innings on April 3. Sidney took a 1-0 lead in the top of the first when Westerbeck batted in a run on a groundout. The squad increased the lead to 2-0 in the second after a fielder’s choice groundout by Smith allowed Herrick to score. Troy tied it in the second. Bass led off the inning with a home run to right field, then the Trojans scored another run after an error by Stephens allowed Jaiden Hunt to reach second and two sacrifice groundouts brought her home. 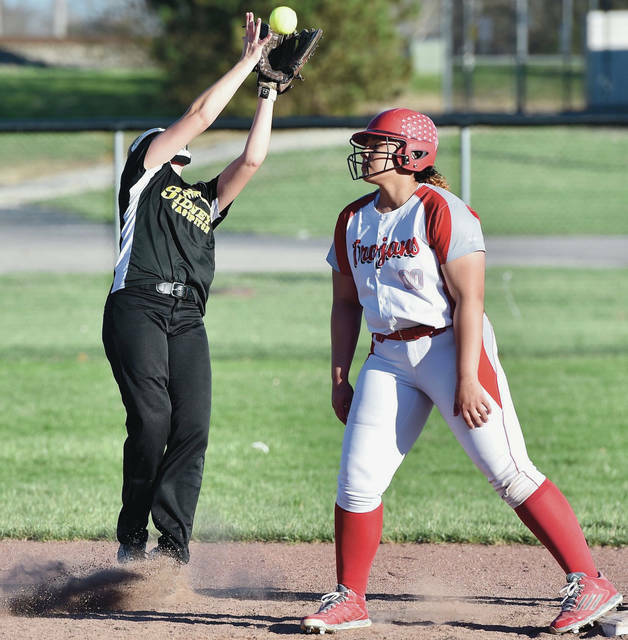 Sidney had two outs with a runner at second in the fourth when Troy coach Scott Beeler removed starting pitcher Erica Keenan and brought in James. Milanese immediately hit a home run to left field to put Sidney ahead 4-2. James walked Jenna Smith and then was replaced in the circle by Bass, who walked Benshoff. Stephens then hit a two-run double that rolled to center field to increase the lead to 6-2. The Trojans scored three runs on three hits, two walks and one error in the bottom of the inning to pull within 6-5. The Trojans boosted their lead to three runs in the fifth after a two-run double by Madelynn Lavender and a fielding error on a grounder by Megan Malott allowed a run to score. Westerbeck hit a sacrifice fly in the sixth that scored a run to bring Sidney within 8-7. Sidney will play next on Thursday at Bellefontaine. 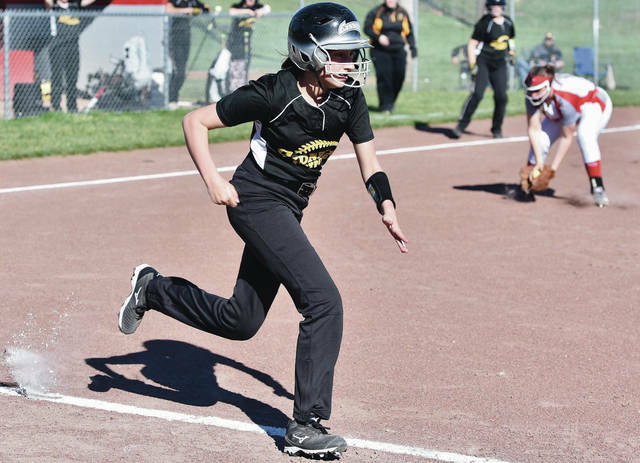 Sidney’s Jenna Smith runs for first as Troy’s Lilly James picks up her bunt during a Greater Western Ohio Conference American North Division game on Tuesday in Troy. 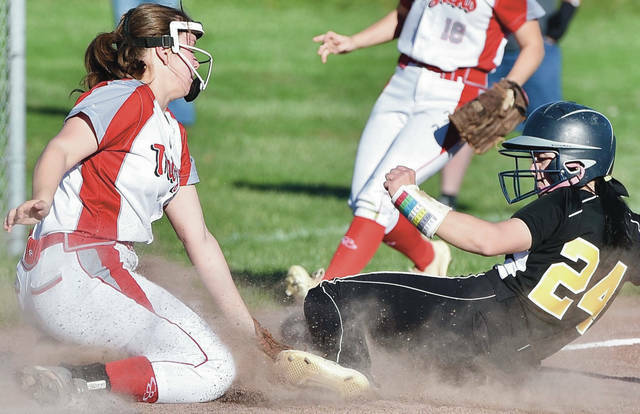 https://www.sidneydailynews.com/wp-content/uploads/sites/47/2019/04/web1_Troy11Sid1-1.jpgSidney’s Jenna Smith runs for first as Troy’s Lilly James picks up her bunt during a Greater Western Ohio Conference American North Division game on Tuesday in Troy. Sidney’s Lauren Barker catches a hit next to Troy’s Tia Bass at second base during a Greater Western Ohio Conference American North Division game on Tuesday in Troy. Sidney’s Lauren Barker pitches during a Greater Western Ohio Conference American North Division game on Tuesday in Troy.